The West Michigan area is blessed by its abundance of water...from Lake Michigan to inland lakes to the mighty Pere Marquette River. Larger watercraft are needed on the bigger bodies of water, but for a more relaxed day, you have to experience the P.M. River. And the place to start is at Baldwin Canoe Rental. They're known for their inventory of top quality equipment, inspected yearly by the State of Michigan. Families, group outings, couples and individuals trust Baldwin Canoe Rental when they need watercraft rental for their P.M. River excursion. Baldwin Canoe Rental carries every type of small watercraft, including the most requested Old Town Canoes. Like to kayak by yourself? Rent a solo kayak, or pair with someone in a tandem kayak. 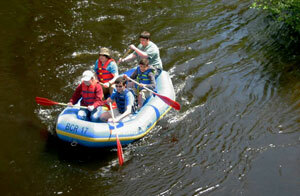 Baldwin Canoe Rental also has tubes and rafts for that leisurely float down the river. Get a bunch of friends or family together on a six-person raft, but note that you'll move a bit slower than a single raft. Rent anything for just two hours...or up to three days. Prices start at $35 for solo kayaks; $45 for canoes and includes bus service from the end of your trip back to your vehicle. 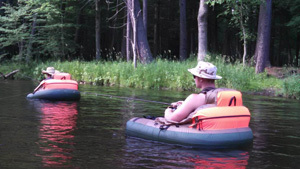 Safety equipment such as life jackets and cushions is provided by Baldwin Canoe Rental. 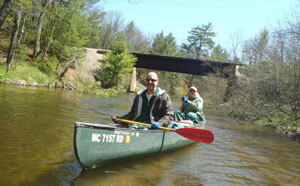 Explore the Pere Marquette River! The P.M. River covers 66 miles over four counties, and is considered to be Michigan's clearest free flowing river. At two to four feet deep and 30-40 feet wide, the current is steady but does not present problems for the beginning paddler. It winds through forested land and various type of wildlife can be seen. Now Offering Guided River Tours! Ever wanted a relaxing float on the river without touching a paddle? Baldwin Canoe Rentals has teamed up with Pere Marquette River Lodge and their guides to offer a drift boat experience along the Pere Marquette River! Pack a cooler and relax...River guides are extremely knowledgeable about the river and its history. Check out their website for pricing and details. The U.S. Forest Service limits the amount of watercraft on the P.M. River each day. Watercraft hours on the river are 9am-6pm, and you must obtain a daily permit for $3 from the Forest Service for the section of river you would like to paddle, if you are using your own watercraft. The staff at Baldwin Canoe Rental knows the river and its rules, and will be happy to talk with you regarding your trip. There are also campgrounds along the river for primitive camping, and they can provide information on these sites. The primitive campgrounds have picnic tables and fire rings; Pere Marquette Campground KOA (about 1.5 miles from Sulak Landing) has water hook ups and electricity, and the modern sites are equipped with hot water and flush toilets. 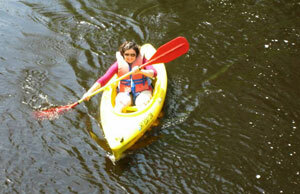 Paddling the Pere Marquette River is a healthy and wholesome activity for the entire family. It's the perfect and affordable way to spend a summer day, and opens up dialogue with children about enjoying and protecting our environment. The folks at Baldwin Canoe Rental invite you to try a canoe or kayak, even if you've never done it before. Their experience and knowledge about the P.M. River and large inventory of canoes and kayaks will benefit you and make your trip one to remember. 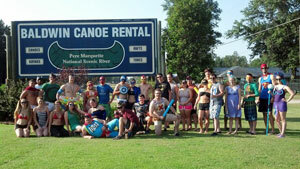 Baldwin Canoe Rentals can Spot Your Car! 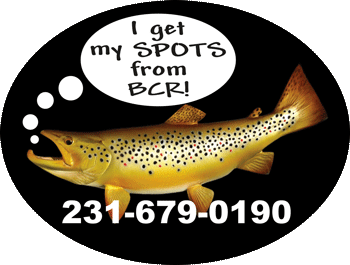 If you own your own watercraft and are planning a trip on the Pere Marquette River, give Baldwin Canoe Rentals a call or text, and they will spot your car! They are Licensed, Permitted and Insured to car spot at all landings from Baldwin to Scottville. All spots are only $25 (not including parking pass). For details or to sign up, visit their website.